We have had good experiences with SIXT car hire but everyone will have their own preference. IMPORTANT NOTE: Snow chains are required on some roads in certain weather conditions. They can be hired at Dover. You can catch a bus from right outside of Terminal 1 at Salzburg Airport. From there it is a 20-minute bus ride to Salzburg Train Station. Trains run from Salzburg to Schladming. From Schladming it is a 10-minute car journey to Haus Maria. You can catch a bus, get a taxi or call us and we will come and get you. 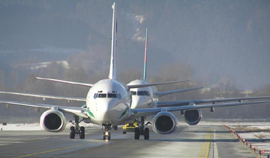 Hire a car from the airport or drive/ride over to us from the UK. We are only 730 miles from Calais via the most direct route but we can also help you plan more scenic routes and overnight accommodation. Winter Tyres are compulsory from 1st Nov to 15th April for Austrian residents. Snow chains are required by everyone on some roads in certain weather conditions. They can be hired at Dover or from Car Hire centers. We would strongly recommend you have them, even if you never need them. Join the Motorway/A1 Heading towards Villach and Munich. After a short distance the Motorway splits to the A1 towards Munich and the A10 towards Villach and Graz. Stay to the right and follow the A10 towards Villach and Graz for approximately 65 km. 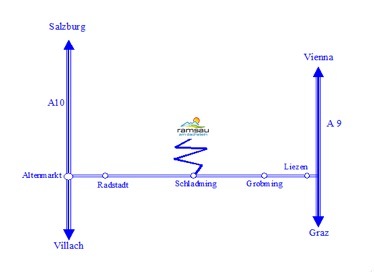 Leave A10 at the junction for Radstadt, Schladming and Graz. At Radstadt take the B320 towards Schladming and Graz. At the next junction turn left towards Ramsau and follow the road up the mountain. At the top of the mountain you will enter Ramsau Kulm. Drive through the village and you will pass the Spar and Billa Supermarkets on your left. Take the next junction on the right signposted towards Weißenbach and Rossing. Take the next turning on the left, which has a large signboard with premises names in green and white. Follow this road up the hill and take the first little lane on the right. Haus Maria is in front of you. Route B – Scenic route. Leave the A10 at Eben and follow the signposts towards Filzmoos and Ramsau Am Dachstein. Stay on this road and travel through Filzmoos (approx 15 mins from the A10). In the centre of Filzmoos is a roundabout. Take the first turning towards Ramsau Am Dachstein. Stay on this road and continue on through Ramsau Ort, (approx 15 minutes from Filzmoos). As you leave Ramsau Ort, look out for a BP garage on your left and then take the next turning left signposted towards Weissenbach and Rossing. Follow this road right up the hill and take the first little lane on the right. Haus Maria is in front of you.